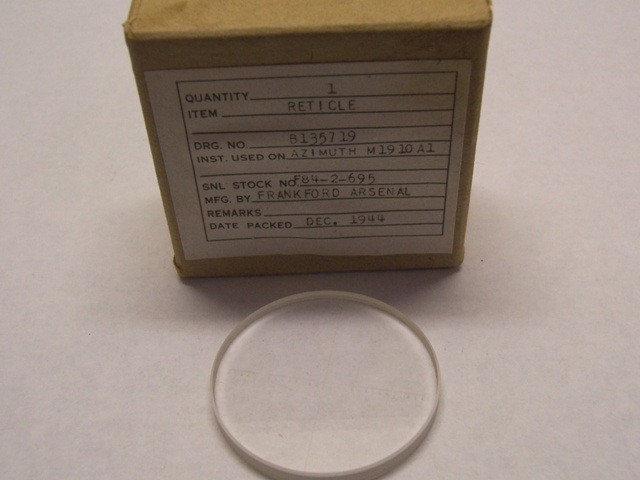 Manufactured by Frankford Arsenal this item was packaged in Dec. of 1944 During World War II. Original Stock # F84-2-695. This is a very nice 35mm diameter by 3.5mm thick crosshair reticle. On the crosshair going left and right the large numbers are 2,3, and 4 with 3 directly in the middle of the reticle. Between the large numbers are 1-9 in the smaller markings. Unused in their original boxes. Nice military collectible.